230- Assessment of Dynamic Cerebral Autoregulation in Patients with Basilar Artery Stenosis – Gong et al. 231- Stability of cerebral metabolism and substrate availability in humans during hypoxia and hyperoxia – Ainslie et al. 232- Cerebral blood flow response to acute hypoxic hypoxia – Harris et al. I won’t have to get rid of my TCD ! Because of its high temporal resolution in monitoring cerebral blood flow velocity changes in cerebral arteries, transcranial Doppler (TCD) represents a very interesting tool to characterize cerebral autoregulation (for basic information in regards to cerebral autoregulation, see post #1 and post #2). The problem we have with this technology is that we are measuring a velocity, and not blood flow, since the diameter of intracranial arteries cannot be monitored with such a device. We have thus to assume that the diameter of these cerebral arteries remains constant in response to blood pressure changes. In a recent paper, Liu et al. simultaneously monitored changes in cerebral blood flow velocity in the middle cerebral artery (with TCD) and internal carotid artery as well cerebral blood flow in the internal carotid artery (with color-coded duplex ultrasonography (CCDU) during steady-state changes in arterial pressure using sodium nitroprusside and phenylephrine in a group of healthy volunteers. The authors tested the hypothesis that cerebral blood flow could be assessed equally well based on the measurements of cerebral blood flow velocity in the middle cerebral artery and volumetric cerebral blood flow in the internal carotid artery. As stated by the authors, the outcome of this study would provide important information regarding the validity of using TCD (and thus to measure a velocity) to assess cerebral autoregulation during steady-state changes in arterial pressure. In this study, cerebral autoregulation was characterized by linear regression of percentage changes in cerebral blood flow velocity, cerebral blood flow, cerebrovascular resistance index (estimated as mean arterial pressure/cerebral blood flow velocity), or cerebrovascular reactivity (estimated as mean arterial pressure/cerebral blood flow) in response to percentage changes in mean arterial pressure. *For percent changes in cerebral blood flow/cerebral blood flow velocity: a slope of about 0 = intact autoregulation vs. increased slope = impaired autoregulation; **For percent changes in cerebrovascular resistance index/cerebrovascular resistance: a slope of about 1.0 = intact autoregulation. ***This figure represents pooled data and not individual data. 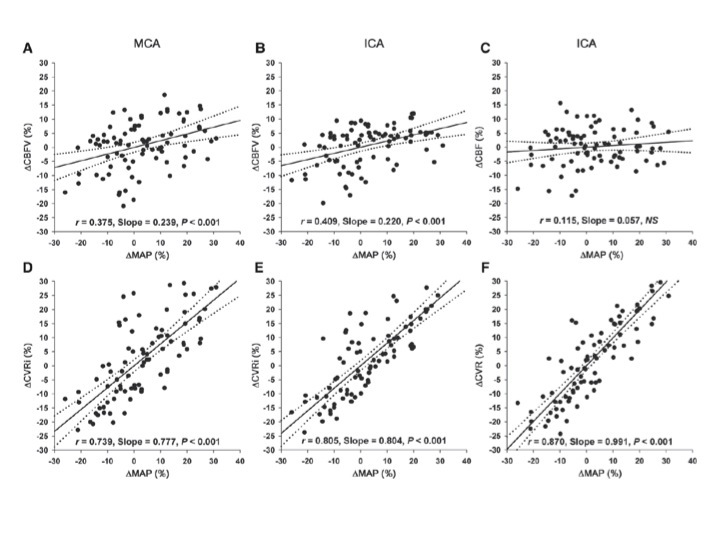 As we can see, changes in cerebral blood flow velocity (A) and cerebrovascular resistance index (D) in response to arterial pressure changes measured in the middle cerebral artery using TCD were rather similar to those monitored in the internal carotid artery using CCDU (B and E). Since the regression slopes of changes in cerebral blood flow velocity to mean arterial pressure were small while those of changes in cerebrovascular resistance index to mean arterial pressure were large, these observations suggest presence of cerebral autoregulation. Interestingly, when we look at changes in blood flow in the internal carotid artery in response to changes in arterial pressure (C), it remains unchanged notwithstanding large variations in mean arterial pressure. In addition, the regression slope of cerebrovascular resistance to mean arterial pressure (F) was steeper than that of cerebrovascular resistance index to mean arterial pressure. Accordingly, cerebral autoregulation seems underestimated when measuring blood flow velocity with TCD (when using this specific methodology). Overall, this is great news! I won’t have to get rid of my TCD !!! Further research is however needed to elucidate if the autoregulation curve described by Lassen can be obtained within an individual, since it was not the case in this study. You will know see a link to the labs of Drs David Simpson, Stephen Payne et Ronney Panerai, who are all involved in the study of cerebral autoregulation. 226- Integrative physiologic and computational approaches to understand autonomic control of cerebral autoregulation – Tan et al. 228- Dynamic cerebral autoregulation in pregnancy and the risk of preeclampsia – Janzarik et al. 229- Enhancement of vasoreactivity and cognition by intranasal insulin in type 2 diabetes – Vera et al. The American Journal of Physiology – Heart and Circulatory Physiology is inviting submission of original research articles related to cardiovascular and cerebrovascular aging. Deadline for articles submission is January 15th, 2014! Interested by this call for papers ? Go have a look here. 225- Measuring cerebrovascular reactivity: What stimulus to use? – Fierstra et al.